Home » Blog » Not too late to sign your kid up for Bike Camp adventures! Not too late to sign your kid up for Bike Camp adventures! Bike Camp is, at its heart, a fun and empowering experience for kids. 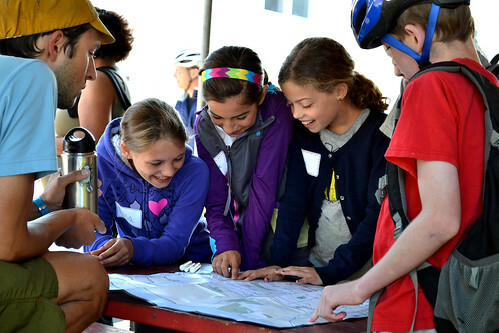 Campers learn how to ride safely, fix their bikes, and travel to fun destinations throughout the city. We keep our traditions alive, such as weekly bike-delivered fruit popsicles, camp games, and visiting some of our friends and neighbors in the bike industry. Learn more about Bike Camp here. This year we also have a fun Bike Camp Assistant opportunity for youth between the ages of 14-20 years old. This is a volunteer opportunity for youth to build leadership skills by supporting our camp instructors for 1-week sessions over the summer. Bike Camp Assistants must be able to attend the entire week of camp and must be able to attend a half-day training during the week of June 9th -13th. For more information, visit our Bike Camp Assistant page.